From the Canyon Edge: When was the last time your operating system released EARLY? When was the last time your operating system released EARLY? 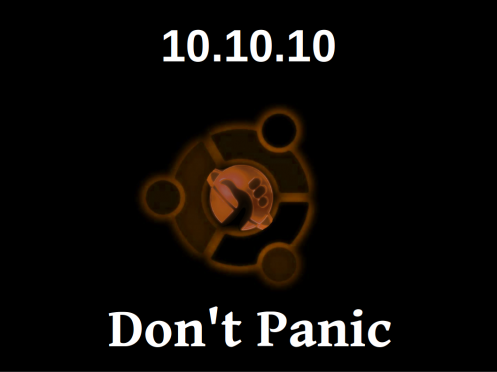 If you haven't heard Robbie Williamson's announcement yet, Ubuntu 10.10 (Maverick Meerkat) will be released on the 10th day of the 10th month of this year. That's 10.10.10 (in both European and US calendar notation). And what's a bit more fun for the well-read geeks among us, 101010 in binary is 42 in decimal -- yep, the ultimate answer to life, the universe, and everything! Not to pick on our friends too much at Microsoft, Fedora, or Debian, but delayed releases are simply the status quo in the software world. It was the same story with most software projects at my former employers as well. That's just the expectation in most project management circles, it seems. Pick a date, and start working on a contingency plan almost immediately. But Ubuntu, I contend, has pioneered something special in world of software development processes. 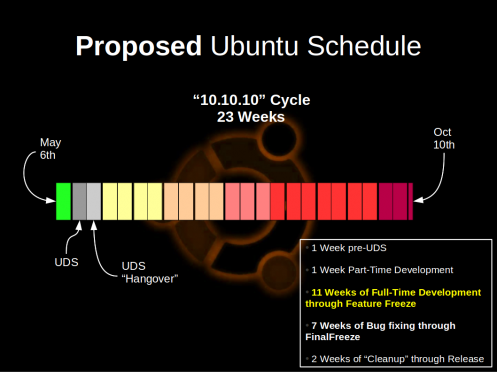 The only reason that we can even consider releasing Maverick 3 weeks early is that we have an outstanding track record, adhering to our time-based release schedules and releasing perfectly in cadence 11 out of the last 12 Ubuntu releases, over the past 6 years. 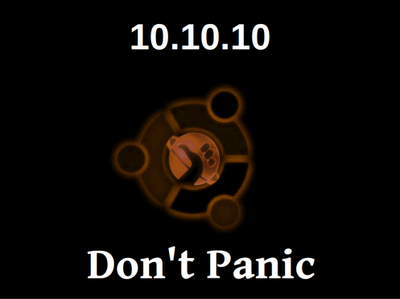 The lone hiccup being 6.06 (Dapper Drake), which introduced a 6-week delay in establishing the first Ubuntu LTS release. Ambitious? Perhaps a bit. Don't Panic. Share and Enjoy. I'm looking forward to it! Yet the other side to that is releasing ready or not. 10.04 seemed like a rushed job on my end. Thing were pushed that I could live without - me menu - and things like the software center can't install software. Until I put Mint 9rc on I could not log off without locking the screen first. I can't think of anything 10.04 gave me over 9.10. Everything unique to 10.04 I have removed or don't use. 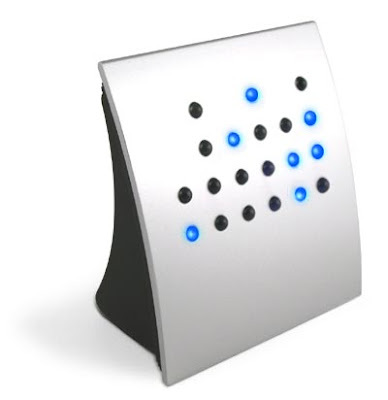 I do hope 10.10.10 will be more than a branding gimmick. I'm shocked to see your criticism of Debian and Fedora and claiming that they could learn a lesson from Canonical. Quote : "But Ubuntu, I contend, has pioneered something special in world of software development processes. " I'd agree with this, Canonical has done something very different, the model at Canonical is fundamentally different to Debian and Fedora. Canonical is mainly around packaging and polish and not around actual development. If I look at the list of new features in 10.04 how many of those come from Canonical? While there's certainly a lot of desktop polish that's put into a release you're missing the *real* work of writing the code. Criticising Debian and Fedora is just biting the hand that feeds you. There was a great example right at the end of the 10.04 release cycle, a critical issue came up with ext4 in lucid. release deadline as a cost-saving mechanism to avoid hiring their own senior kernel engineers"
What was the response from Canonical's engineers? File a bug in fedora! I only get upset with Canonical's model when I hear them taking credit for others work and throwing this kind of FUD around.